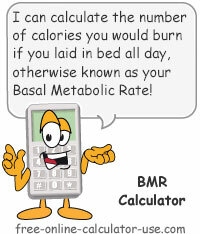 This calculator will calculate your Basal Metabolic Rate (metabolism) for male or female and using either standard or metric measurements. The calculated results also includes your estimated daily calories burned for each of 5 separate activity levels, and a chart and graph showing how your BMR (also known as "RMR") will change each year over the course of the next 20 years. Based on your entries, this is your resting metabolic rate (metabolism), which is the essentially the number of calories you would burn if you laid in bed all day. Once you know your Basal Metabolic Rate you can use that figure to estimate the total number of calories you burn per day. The following fields indicate your estimated daily calories burned based on each of 5 activity levels. Little to zero exercise. This is equal to your BMR x 1.2. Low exercise or sports 1 to 3 days per week. This is equal to your BMR x 1.375. Medium exercise or sports 3 to 5 days per week. This is equal to your BMR x 1.55. Intense exercise/sports 6 to 7 days per week. This is equal to your BMR x 1.725. Intense twice daily exercise, intense physical job. This is equal to your BMR x 1.9. This calculator will help you to calculate the total calories you would expend if you spent all day resting. This is also referred to as your "metabolism." Plus, the calculator will use your calculated BMR to estimate your daily calories burned for each of 5 different activity levels. Finally, the calculator will also display a chart and graph showing your estimated BMR at each age over the course of the next 20 years. As you get older your metabolism tends to slow down, making it increasingly difficult to maintain and lose weight. Calculating your Basal Metabolic Rate at each age will help keep you abreast of where your activity level needs to be in order to lose or maintain weight (see Weight Calorie Tool for calculating caloric adjustments needed to achieve weight goals). Click the "Calculate BRM" button. This will display your calculated basal metabolic rate, the daily calories burned at each activity level, and a year-by-year chart and graph showing how your BMR will change as you age. The energy required to raise the temperature of 1 gram of water by 1 degree Celsius. The typical adult needs 1,000 to 1,400 calories per day just to fuel basic organs. An additional 400-600 calories are needed to go from laying still all day to moving around during the day. For every 3,500 calories you take in that are over and above the amount you need to maintain your weight, you will gain 1 pound.